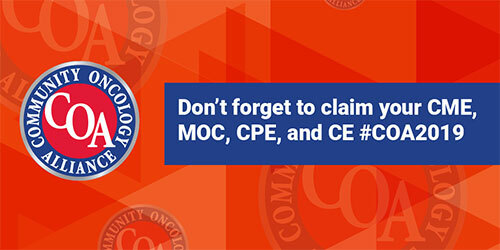 The annual Community Oncology Conference is the only conference developed by community oncology providers, administrators, staff, pharmacists, nurses, and advocates to address the unique issues facing community oncology in the real world. 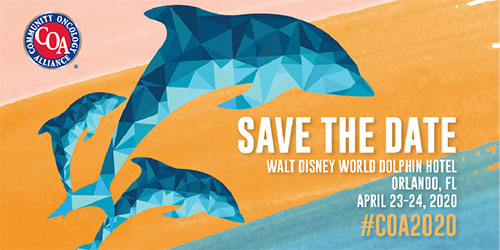 Four separate tracks—clinical, business, advocacy, and pharmacy—will feature expert sessions planned by leaders working in that specific sector. Regardless of your role, you will meet others facing the same challenges you face, and you will take something back that benefits your practice and the patients you serve. 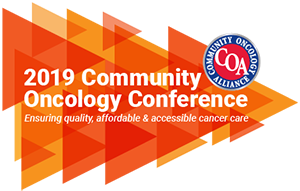 The theme for the Community Oncology Alliance (COA) 2019 Community Oncology Conference is “Ensuring Quality, Affordable & Accessible Cancer Care.” These are critically important areas for patients with cancer and a key differentiator for community oncology practices. The Conference will focus on empowering practices and professionals to thrive in the community oncology system of the future. 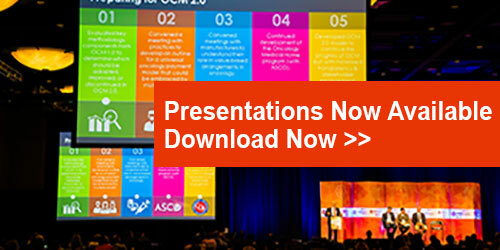 COA has been on the frontlines of cancer care over the last year, listening and learning on behalf of all practices, oncology professionals, and patients. Through our advocacy in DC, hugely successful learning networks, and peer networks we have taken the latest knowledge and built a powerful 2019 Conference. WHY ATTEND THE COMMUNITY ONCOLOGY CONFERENCE?